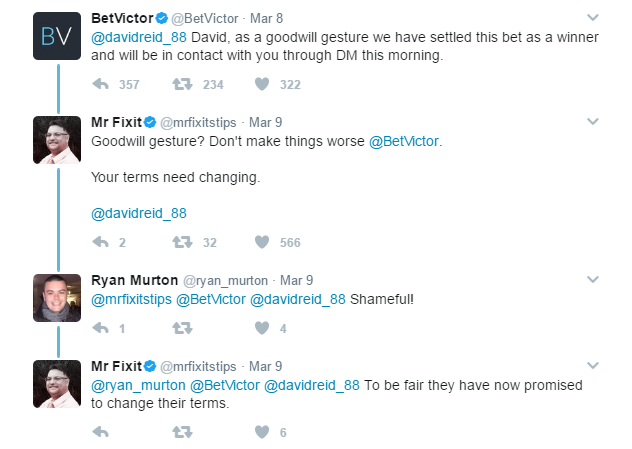 On Wednesday of this week BetVictor had a bit of a PR nightmare during their ‘Price it up’ promotion on Twitter. For those who don’t know, you can request odds on a unique selection of bets via Twitter. In this specific case, one punter (@davidreid88) requested a price up on the following bet: Messi to score a penalty, Cavani to hit the woodwork and Barcalona to qualify. BetVictor consequently costed this up at odds of 125/1 and @davidreid88 subsequently placed a £5 bet on this selection. Now, one could be forgiven for getting a bit caught up in what was an extraordinary game between Barcelona and PSG, making history in fact as the greatest comeback in Champions league history. It would appear though, that Twitter did not get distracted from the events that proceeded transpire. It just so happens that Messi scored a penalty, Cavani hit the woodwork and Barcalona went on to qualify. Resulting in an amazing £625 win for @davidreid88, or so we all thought. For this is when things all started to go wrong. BetVictor then explained, over Twitter, why @davidreid88 had, in fact, not won. According to BetVictor, Cavani had not “hit the woodwork” because the ball went out of play after striking the woodwork, and according to their Terms & Conditions the ball would need to stay in play. 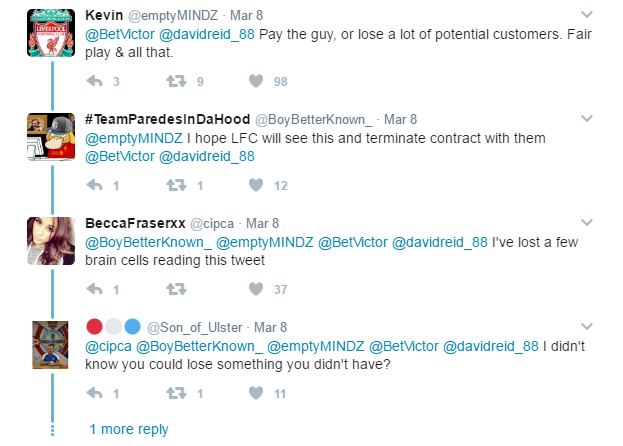 If you think this sounds ridiculous, you’re not alone and BetVictor soon found themselves in the eye of a PR storm as thousands rallied around @davidreid_88 and proceeded to hurl insults at BetVictor. The below screenshot is but a small selection of the sort of tweets that started flooding BetVictor. Now, from a legal standpoint BetVictor were technically right. 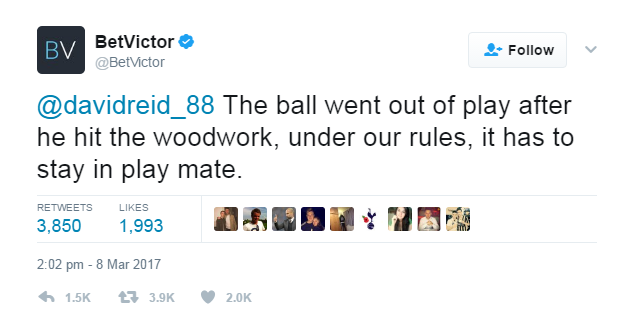 In their terms and conditions it does indeed state that the ball must stay in play after striking the woodwork. However, this is a ridiculous rule to have, let alone enforce. It is normally something that goes under the radar with most bookmaker offers. However, once it is publically highlighted it really demonstrates how borderline “criminal” some of the bookmakers ‘terms’ are. What made this situation even worse was the sluggish response from BetVictor’s social team. This could have been very easily contained by simply paying out on the bet and saying they’ll ‘review their terms and conditions’. However, they left it far too long and this resulted in many Twitter users contacting various betting authorities to complain. This will no doubt result in a review of such ridiculous rules within the T&Cs of bookmaker offers. The result of this whole sorry saga was BetVictor eventually capitulating and paying out. However, they once again shot themselves in the foot with a seemingly less that sincere message. All in all a very sorry end to a damaging saga for BetVictor. However, for us Matched Bettors this is good news. There will now be more of a spotlight on Reload offer terms and conditions, which hopefully should make triggering certain reload offers a little easier.